OpenFOAM sustainability involves developing software that meets critical needs of users, through a balance of resources, technology, investment and institutional support. 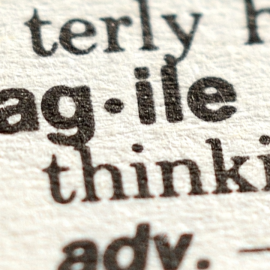 The critical needs are availability, usability, robustness and extensibility. 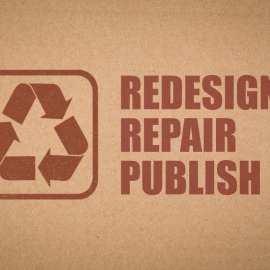 The critical work required to meet those needs are publishing, repair and redesign. Employers rarely allocate time to individuals to contribute critical work, so it is generally left to “career maintainers” at CFD Direct. With limited funding, decisions about the critical work are made by those who fund and/or contribute the work, via The OpenFOAM Hub. In Year 3 of CFD Direct, we developed new functionality in OpenFOAM and maintained critical components of the code base, reducing the number of unresolved issues by 45%. We managed the OpenFOAM Foundation: promoting sustainable development, releasing OpenFOAM v5, packaging OpenFOAM-dev and publishing websites and documentation. We delivered 60 days of OpenFOAM Training, introducing our new “hybrid” classroom-virtual courses to host participants in person and remotely. We launched the new Cloud CFD course to teach inexpensive, secure, efficient CFD with CFD Direct From the Cloud™. OpenFOAM is free, open source software for computational fluid dynamics (CFD). At the heart of OpenFOAM is a development kit (“SDK”), providing software and tools to build CFD applications, enabling users to customise their CFD, quickly and conveniently. CFD Direct includes OpenFOAM developers who maintain the SDK. We manage an environment for sustainable OpenFOAM development that involves: early public code release with rapid-turnaround user feedback; a network of developers, funding companies and users; and, co-ordinated code integration and maintenance. During Year 2, CFD Direct made over 1000 code commits to the public development line of OpenFOAM, making us by far the largest contributor of code to OpenFOAM. We produced the major new version 4.0 release of OpenFOAM and the minor update version 4.1 release. We transformed OpenFOAM-dev into stable software of “always-releasable” quality and package it weekly for Ubuntu. Ubuntu packs can now be installed directly on Windows 10 and we also provide “containerized” versions, hosted on Docker Hub, accompanied by launch scripts for easy installation of OpenFOAM on Linux and macOS. 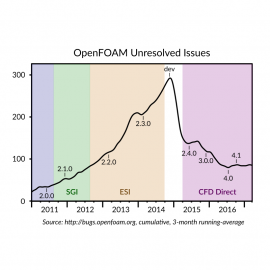 In Year 2, CFD Direct handled almost 500 issues on the OpenFOAM issue tracking system. 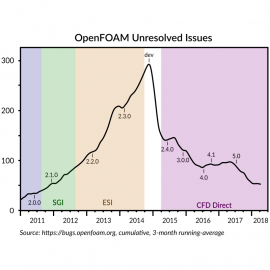 We upgraded the system and and analyzed metrics relating to timely resolution of issues which concluded that current unresolved issues relate to badly designed components of OpenFOAM that require significant code rewriting. 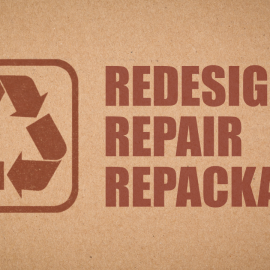 To fund that repair work and ongoing maintenance, we ran a successful campaign to raise €100 k from companies that benefit from OpenFOAM. We carried out substantial maintenance to OpenFOAM websites, significant updates to documentation, and administration for the OpenFOAM Foundation. OpenFOAM is free, open source software in computational fluid dynamics for real-world engineering and scientific applications. CFD Direct is committed to maintain OpenFOAM, demonstrated by the thousands of code commits to OpenFOAM-dev, with support from contributors. Maintenance concerns the evolution of software in response to changes in user expectation and environment. 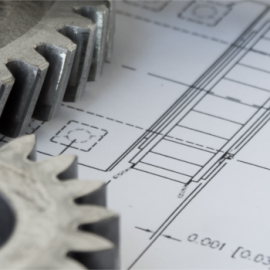 We have introduced an agile strategy suitable to the feedback process of software evolution and have identified key areas of OpenFOAM that requiring significant redesign, e.g. AMI and particles.